When it comes to restaurant talk, I don't just dish it out. I'm an insatiable consumer. I read everything I can about the Prague scene. Unfortunately, there aren't many people writing regularly in English about the city's restaurants anymore. The Prague Spoon blog has ceased. The Czech Business Weekly is no more. On the bright side, there is a fun new food and drink blog that just started called Knedliky, etc. I'm also a fan of one of the few others left out there, Claire Compton, a restaurant writer at The Prague Post. Her reviews have creative but brief opens, straightforward, unpretentious descriptions, and lots of useful information. In last week's review, she gave the food at Céleste Bistro a rave for quality and value, so I bumped it up to the top of my to-do list. The Old Town restaurant is in the same space as the defunct, Asian-fusion spot, Angel, which I quite liked. The interior design and furniture have remained the same, as has the ownership. It has the same owners as Céleste, the restaurant at the top of the "Dancing House." I still like Céleste Bistro's lighting and the coordinated beige/brown themes. 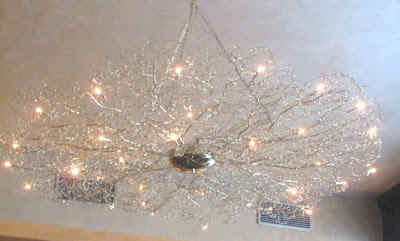 The golden, branch-like chandelier is a favorite feature. But the wide-open space of the small room isn't conducive great atmosphere because the tables are just too close together. In her article, Compton said that on her weeknight visits, the restaurant was almost empty. Perhaps because of the good review or because it was Saturday night, the restaurant was half-full was there with my Good Friend. We shared close quarters with two other diners. 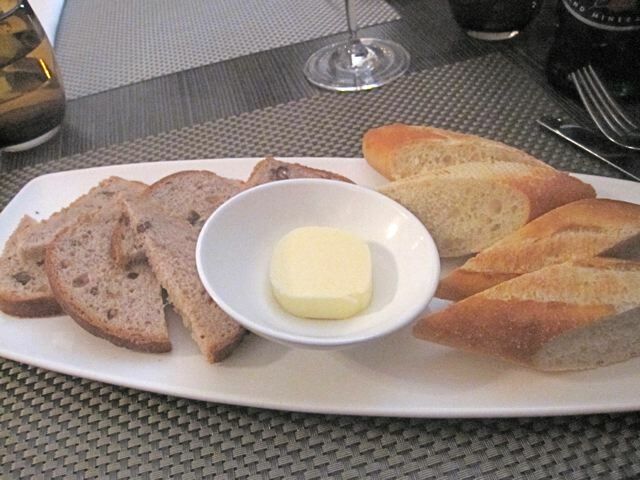 Our waitress brought us bread and butter. There were baguette slices on the plate along with walnut bread. Both were cold, a little dry, and neither impressed me. The butter was cold and hard to spread. 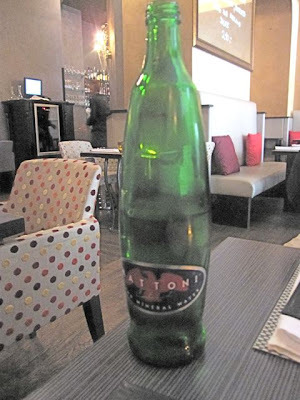 I ordered a .75 liter bottle of Mattoni sparkling mineral water (75 CZK). I'm always glad when restaurants have this Czech product on the menu, especially when it is fairly priced. 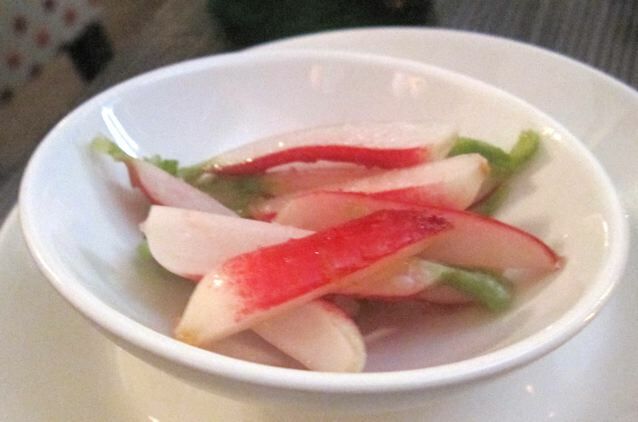 We received an interesting little snack or amuse bouche from the kitchen: a plate of sliced radish coated in salt and olive oil. It was a refreshing and unconventional palate cleanser. For my starter, I had the terrine of goose foie gras with black cherry marmalade and homemade toast (290 CZK). Compton's description of it as tasting like "a grown-up version of peanut butter and jelly" is pretty hard to beat. I had the same impression. 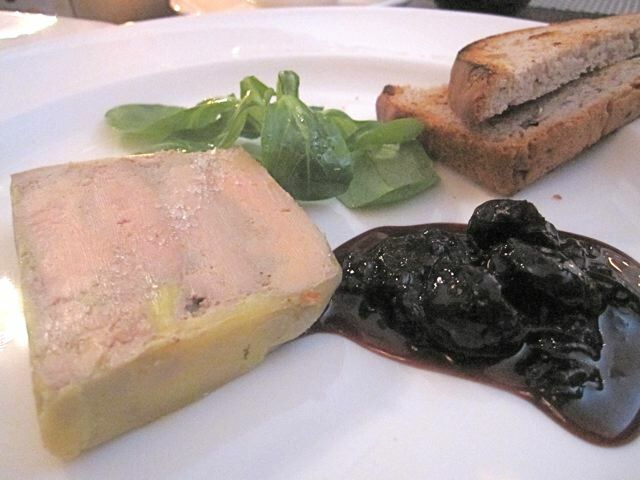 The foie gras was salty, but unlike peanut butter, it was silky smooth. The cherries were intensely sweet. These exotic components did balance each other, but I daresay it was too simple for me. I found myself wishing for another dimension -- perhaps a sour note, or a hint of wine with the cherries. I also wanted for more toast. The two small triangles I received were not enough. Good Friend got the grilled king prawns with garlic butter and roasted peppers (245 CZK). I'm trying to use my flash less these days, so I'm sorry about the blur. The shrimp tasted like they had just been cooked in the shells and then removed just before serving. They had just the right texture. I thought they were great. 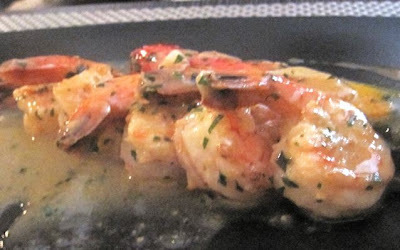 The crustaceans sat under a very butter sauce, but it did not taste strongly of garlic. The peppers were roasted into a very soft state. They didn't offer much beside a hint of their natural flavor. We decided to have red wine with dinner. 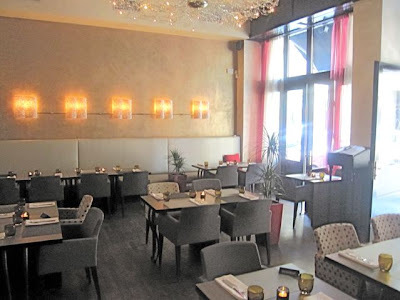 Céleste Bistro has a nice list, with selections from France, Austria, New Zealand, and Moravia. They offer a wide range of prices. 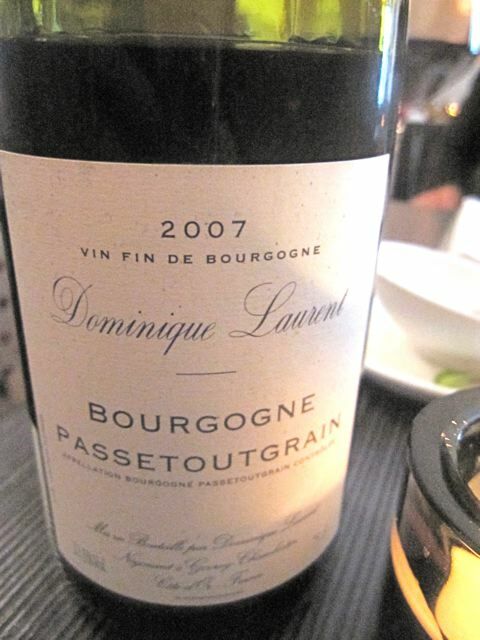 Good Friend chose the 2007 Dominique Laurent Bourgogne Passetoutgrain (495 CZK). It was smooth, and light with a mild fruity note. A good wine for the price. 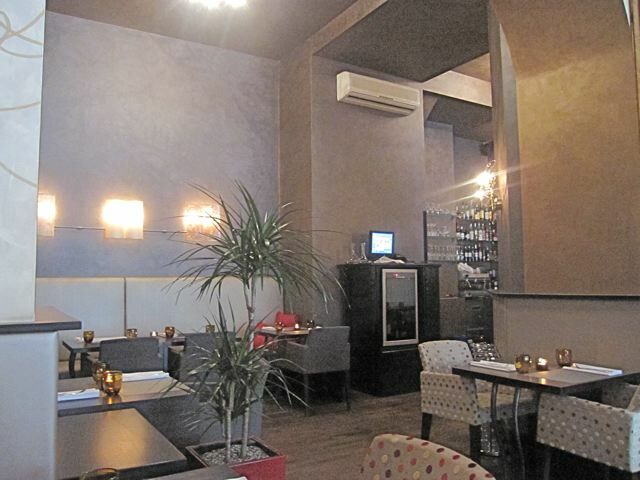 For the main course, I ordered the Moravian organic lamb with aubergine, chickpea and tarragon sauce (385 CZK). The one double and two single chops were meaty. The lamb was super tender and melted in the mouth. The sauce paired well with it. On the other hand, I didn't think the chickpeas cooked in the shape of French fries worked well with this dish. The pureed aubergine underneath seemed like an afterthought and offered little excitement. 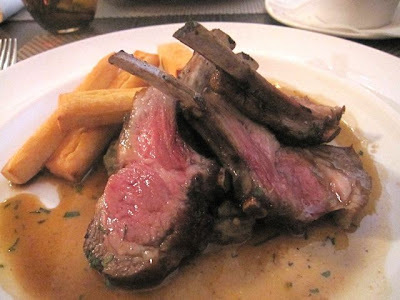 I'd rate the dish as good, but I'd put it in third place for my favorite lamb in Prague behind the chops at Resto Cafe Patio and Argument. Good Friend had the beef entrecôte with strong red wine sauce and homemade French fries (395 CZK). The red wine sauce was pungent, savory, and terrific. 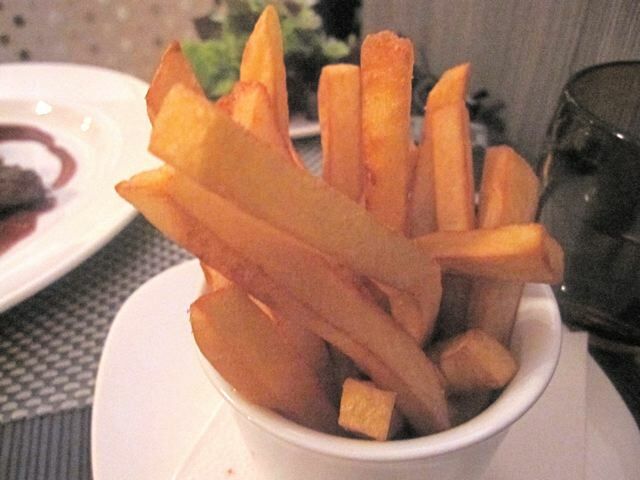 The fries were piping hot, golden and crunchy. 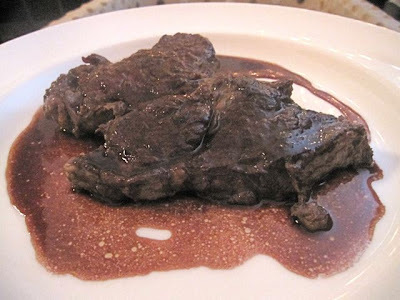 However, the steak itself was not the best-tasting or the tenderest piece of meat. In fact, it was a poor quality cut. I don't mind fat on my beef, especially on an entrecôte or rib eye. But this one also had a fair amount of gristle. Several portions of the steak were inedible. Sure, you can cut around it, but it was disappointing. I decided to go for dessert and deviated from my usual chocolate craving to try a different and intriguing offering: the French toast with pears poached in cinnamon syrup (135 CZK). It was beautiful-looking piece of egg-dipped, fried bread. But it didn't meat my expectations. It was too bready. I'd hoped it would be more on the eggy side. I also had trouble detecting much cinnamon flavor at all. By itself, it was too dry. Fortunately, it came with some deliciously decadent whipped cream. 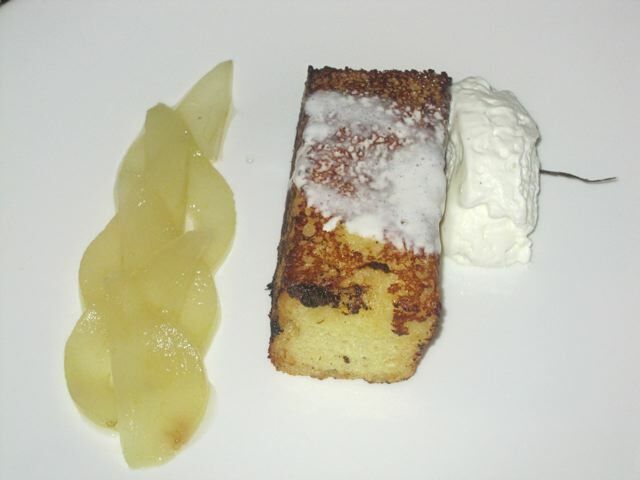 The slice pear looked nice, but mostly provided another sweet angle and different texture. A lot of the natural flavor had been cooked and sugared out of them. The bill came to 2065 CZK. Not too bad when you consider a bottle of wine in there, but maybe a just a little overpriced in my book for the overall quality of the experience. Yes, I found flaws in the food at Céleste Bistro, but want to be clear: I don't mean this as a criticism of The Prague Post's review. If I hear that a restaurant's food is near perfect, I think it's fair to give it extra scrutiny and look for imperfections. The other point to consider is that a restaurant can be quite different depending on the day or the week or the dishes ordered. 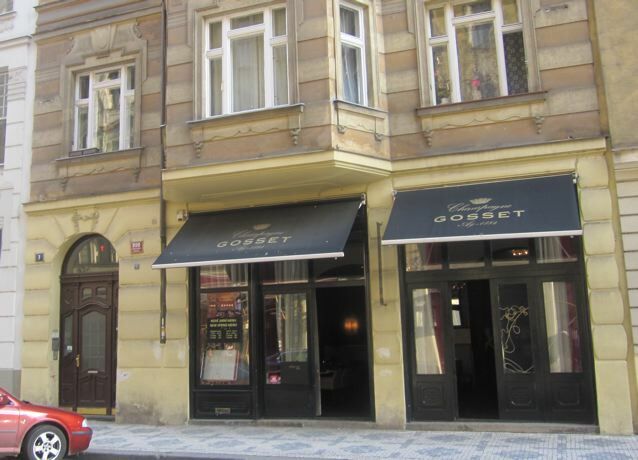 That said, I think Prague needs more restaurants like Céleste Bistro. And if I'm critical, it's only because I'd like to see them find success. 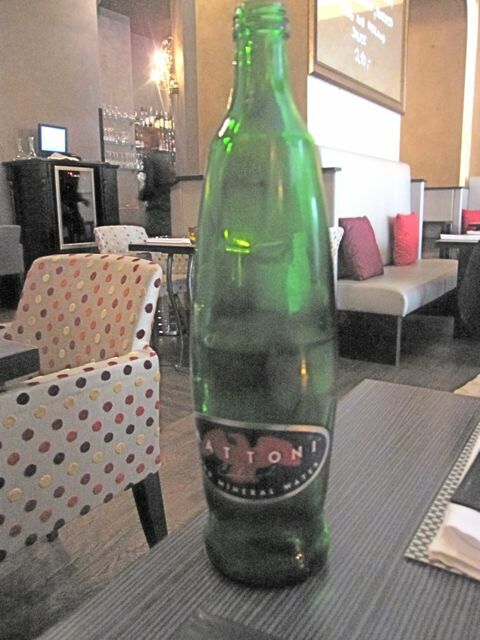 Do they serve beer at Celeste Bistro? Is it the same excellent Kout na Sumave lager they sell at Celeste or another beer brand?